NAYPYITAW – (warsoor) – China has proposed a three-phase plan for resolving the Rohingya crisis, starting with a ceasefire in Myanmar’s Rakhine State so that refugees can return from Bangladesh, China’s Foreign Ministry said ahead of meeting of European and Asian officials in Myanmar on Monday. 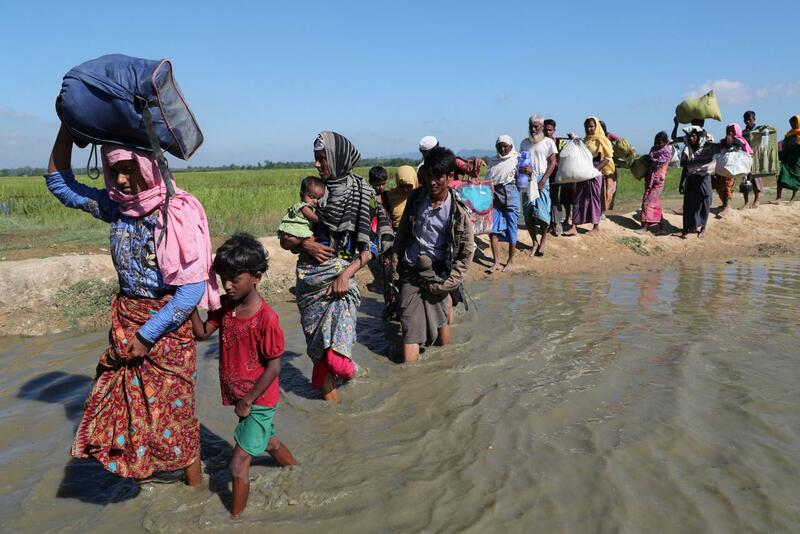 More than 600,000 Muslim Rohingya have fled to Bangladesh since late August driven out by a military clearance operation in Buddhist majority Myanmar’s Rakhine State. The refugees’ suffering has caused an international outcry. The foreign ministers Asia-Europe Meeting, or ASEM, opening in the Myanmar capital Naypyitaw is an important multilateral diplomatic gathering which happens once every two years and is designed to discuss issues between Asia and Europe. The meeting was scheduled to take place in Myanmar before the outbreak of the current crisis. Speaking in Naypyitaw on Sunday having arrived from Dhaka, China’s Foreign Minister Wang Yi said China believed that the Rohingya crisis could be addressed by a solution acceptable to neighbours Myanmar and Bangladesh through consultations. “The first phase it to effect a ceasefire on the ground, to return to stability and order, so the people can enjoy peace and no longer be forced to flee,” China’s foreign ministry said in a statement citing Wang. After a ceasefire is seen to be working, Wang said bilateral dialogue should follow to find a workable solution, and the third and final phase should be to work toward a long-term solution based on poverty alleviation. Wang said poverty was the root cause of the conflict. Myanmar’s military has said that all fighting against the Rohingya Islamist militants died out on Sept.5, but it remains on guard against incursions by fighters who had fled to Bangladesh with the refugees. The refugee crisis erupted after the military launched a brutal counter-insurgency operations against the militants after attacks on an army base and dozens of police security posts in Rakhine on Aug. 25. The group behind those attacks, Arakan Rohingya Salvation Army (ARSA), had declared a one-month ceasefire on Sept.10, which was rejected by the government. But there have been no serious clashes since. Visiting Myanmar last week, U.S. Secretary of State Rex Tillerson condemned ARSA’s attacks, and voiced support for Myanmar’s transition to democracy under the civilian administration led by Nobel peace price winner Aung San Suu Kyi. But Tillerson also called for a credible investigation into reports of human rights abuses against the Rohingya committed by Myanmar’s security forces, whose generals retain autonomy over defence, internal security and border issues. The United States and other Western countries have become more engaged with Myanmar in recent years, since it began a transition to civilian government after nearly 50 years of military rule. Federica Mogherini, the European Union foreign policy chief, was expected to address the ASEM gathering, having also visited Bangladesh over the weekend. Myanmar state media said the meeting was being attended by senior officials of the ASEAN Secretariat, 28 member countries of the EU, two non-EU member countries, 10 member countries of ASEAN, 11 countries of northeast and south Asia totalling 51 countries. China has close relations with both Myanmar and Bangladesh, and has long been a key player in lawless borderlands where rebel ethnic groups have fought Myanmar’s government for decades. The conflict in those border regions have occasionally pushed thousands of refugees to seek shelter in China. Since the Rohingya crisis, China has repeatedly expressed support for what it calls the Myanmar government’s efforts to protect stability. Myanmar and Bangladesh officials began talks last month to settle a repatriation process for refugees, and Bangladesh’s foreign minister expects to take those talks to the next level in coming days. The international community and the United Nations Security Council should give encouragement and support to both countries “to create the necessary conditions and a good environment”, the ministry’s statement quoted Wang as saying at a joint press conference with Aung San Suu Kyi, Myanmar’s de facto leader.